Zooming through the channels last night I landed on Pitch Perfect - about 40 minutes in. I'm not a huge Glee fan - which I figured the movie would be a big screen version of - but nothing else grabbed me so I figured what the hey. And I had a general sense that it had done well critically. I wish I'd seen it sooner. Sweet, funny, romantic with some glorious singing. The story: "Beca, a freshman at Barden University, is cajoled into joining The Bellas, her school's all-girls singing group. 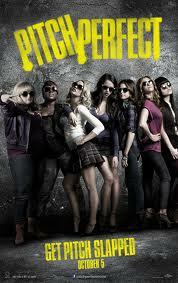 Injecting some much needed energy into their repertoire, The Bellas take on their male rivals in a campus competition." Anna Kendrick (The Company You Keep, Up in the Air) is the emotionally reserved Beca who finds love and friendship through singing. Rebel Wilson, her opposite, shines as the raunchy Fat Amy. Aubrey Camp and Brittany Snow and the rest of the Barden Bellas make beautiful music together. With a script written by Kay Cannon based on Micky Rapkin's book, Pitch Perfect struck just the right chord when I was feeling blue.